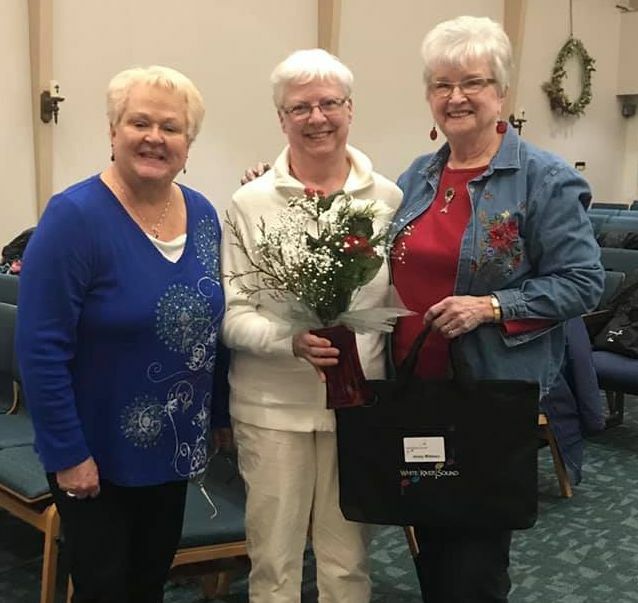 Sweet Adelines International recruits women ages 14 and older to join their local chapter. White River Sound Chorus invites you to join these amazing women of this regional chapter. Our management team will walk you through all the steps of joining this wonderful group of singers, and becoming a member of Sweet Adelines International. On your first visit you will get a glimpse of what we do weekly at rehearsal. You will be given more information regarding the chorus in general. If you aren't hooked on the fun yet, come back for another visit. Once again we will make you feel welcome and answer any questions you might have. If you are ready to sing with us on your first visit, we will love having you join us on the risers. Our director will discuss your voice part with you. Then, she will find a comfortable place on the risers for you with a companion of that voice part nearby. No pressure, but you'll never know how sweet the apple tastes if you don't take that first bite! And sweet it is. This hobby is about learning, growing, and being with fantastic women who lend support. Near the end of rehearsal the membership process is discussed privately and questions answered. You will be given a handbook that reviews membership dues and processes. Before membership is accepted you will be asked to pass an audition which is performed privately with the director and section leaders only. We work with all of our new members assuring comfort. You are sure to feel an immediate sense of belonging. A personal mentor is assigned to ease new members through all of the new activities throughout their first year. You will soon find that sInging is why you join, and friendship is why you stay.